This story is a shout out to all the students who feel like they’re scrambling to just survive the endless world of tests, papers, and studying. I’m right there with you. This is only one of many accounts that shows how untogether my life truly is. Hopefully you’ll find a degree of encouragement and humor somewhere in this event. My story begins at a table in Snappers, Erskine’s greasy, delicious substitute to the cafeteria. After a long day of classes and labs, my friends and I treated ourselves to some much-needed comfort fries. That was the last time I remembered seeing my wallet. Flash forward to my room after dinner. My roommate and I had some time and energy to burn, so naturally we had a Disney dance party, where we discovered our ability to perform ballroom dancing in tight quarters. I was so excited about dancing that I threw my backpack and jacket onto my bed and leapt into action. After the dance party, we settled down into our normal studying routine. The next morning, while I was rifling through my backpack for my student ID, I realized that my wallet was missing. Normally I would pack everything into my backpack the night before class, but I had stayed up so late studying that I went straight to bed without bothering to pack up my things. Obviously losing one’s wallet and all of its contents is kind of a big deal, so I started searching around campus as soon as I could. I tried to recall the last place I remembered holding my wallet, but of course that memory was blocked. Go figure. My wallet hadn’t been put in any of Erskine’s lost and found boxes, so by this point, I was pretty freaked out. As I ran (and I mean literally ran) around the Erskine campus, hoping the wallet was somewhere in the grass, a horrifying thought entered my mind. What if I accidentally threw my wallet in the trash at Snappers while I was throwing away everybody’s trash? I immediately returned to Snappers and asked if I could dig through the trash, despite still being dressed up from having lunch with a prospective student. However, Sue, my friend who works at Snappers, wasn’t about to let me root around in the trash, and she voluntarily dug through three bags of trash before reporting that there was no way my wallet could be there. With steadily increasing anxiety, I walked across campus to my room (by this time, I was out of breath from running) and proceeded to tear apart every inch of the room in search of the wallet. I tore everything off of my bed, ripped out all of the clothes in my dresser and wardrobe, and threw everything out of my desk. The wallet was nowhere to be found. A ray of inspiration hit me as I sat on the floor in despair. I remembered helping Daria carry clothes up from her car last night. Did I take my wallet with me for some odd reason? A new wind hit me and I sprinted out the door and down the hill to her car, but the wallet wasn’t underneath, nearby, or inside her van. As I walked up to my dorm room, I felt more discouraged and stressed than I had felt in a while. Losing a wallet seems like a small problem now, but it did was a tremendous toll on my emotions at the time. It’s extremely frustrating to not be able to find something that is lost. Then, when I walked through the door to my room, I saw it. My wallet had been hanging on a thumbtack on my corkboard this entire time. This is proof that putting things away in their proper place is dangerous and wrong. Just kidding. Long story short, my life is definitely not all together. I’m clumsy, forgetful, easily stressed, and my short-term memory is completely worthless. So how do I make it through each day’s problems and mistakes with a smile and the energy to face another day? God opens my eyes to see and give thanks for the everyday blessings and joys that can shine through the blunders. Today, God answered my desperate, freaked out prayers to simply find my wallet. He provided support from amazing friends like Sue, who cheerfully picked through trash in order to help me. That kind of love still overwhelms me. It’s such a huge relief that my weaknesses can be blessings in disguise by causing the strengths and goodness of others to shine out. This past weekend, I had the privilege of experiencing Erskine’s Orientation through the eyes of a group leader instead of as a freshman. I was chosen to be an Orientation leader in April, so I spent all summer imagining what my time as a leader would be like and what Orientation would be like as a whole. Needless to say, quite a few expectations accumulated in my mind by the end of the summer. But in order to share my expectations, I first need to tell you the reasons behind my desire to work on the Orientation staff. My reasons were threefold: to make Orientation fun for freshmen, to get a head start on making new friends, and to get more involved at Erskine, because I honestly just love my college. My motives behind Orientation became my expectations for Orientation. Thus, I envisioned a whole new group of friends, the feeling of satisfaction from executing a successful Orientation, and the gradual acclimation to a busy school year at Erskine. I moved into Erskine a week before the freshmen moved in and immediately began training and preparing for the busiest week of the school year (in my opinion). Everyone on O Staff was exhausted by the Monday before Move In Day, but we pushed through our fatigue and mustered an amazing amount of energy to get everything squared away before Thursday, when the freshmen arrived. Our fearless leader, Kaley Lindquist, the most detail-oriented person that I have ever met, coordinated every part of the weekend. Orientation would not have been the success that it was if it had not been for her dedication and passion for her job. 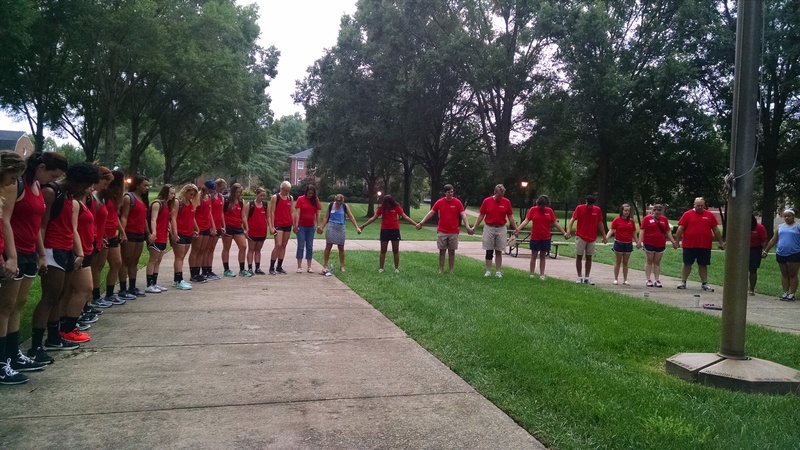 Orientation staff and volunteers gathered around Erskine’s flagpole on Move In Day morning to pray for Orientation. All of the freshmen were split into 12 different groups led by various upperclassmen. My friend Ashley and I were in charge of Group 9; and let me just say that our group was the coolest group ever. Our freshmen had such great attitudes about every activity that we did even though they were just as worn out as we were. 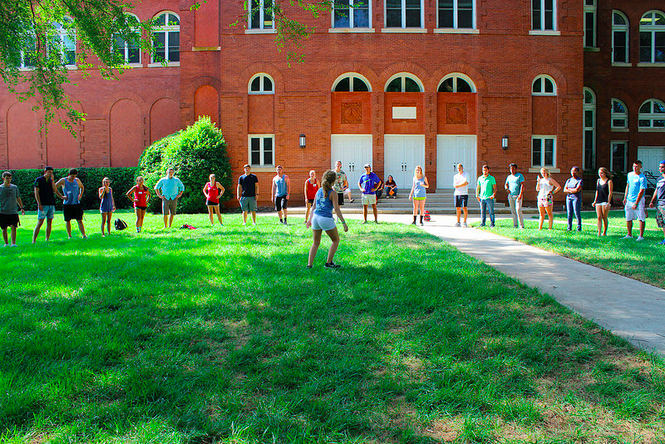 For example, the groups competed against each other to get the most Spirit Points by the end of Orientation. Our group ran around the Erskine campus, performing different activities to get thousands of Spirit Points. We bought 40+ cokes for Kaley, gave more than 20 sets of flowers to the sweet lady who scans our cards in the cafeteria, and even chased around various staff members for selfies (I hadn’t ever posted so many pictures on Instagram in four days). Unfortunately, we did not win first place; but, we got second place, which was the closest to first place that a group can get! We did so many activities in the span of 4 days, including, but not limited to, sessions, skits, contests, games, community service, and soiree. I would like to share all of the memories that were created from Orientation, but you would have to read pages of content, which would likely become tedious after a while. Not to mention, Orientation flew by so quickly that it is a bit of a blurred memory now. But, all good things must come to an end, and so Orientation had to as well. As I reflect on the fruits that were produced from Orientation, I find myself pleasantly surprised. I was pushed to be more confident, more friendly, more sacrificing, more patient, more loving…the list can go on and on. I became friendlier as I got to know not only a whole bunch of really awesome freshmen, but also, as I grew closer to my Orientation coworkers. They were my family for a week. I changed from only being good friends with a handful of the upperclassmen to growing closer to each person in different ways. Despite being surrounded by strangers again and feeling exhausted from attending the various events, this year was still much more comfortable and fun! 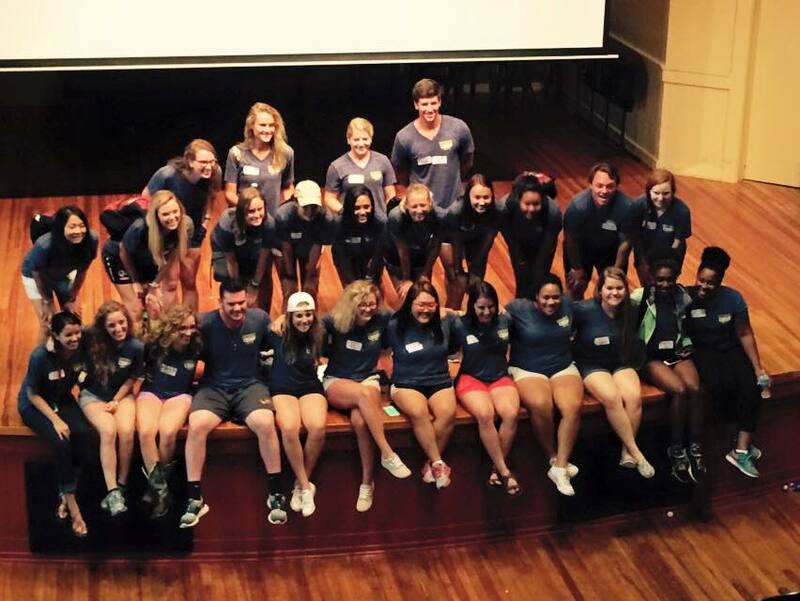 I definitely enjoyed Orientation better as a leader than as a freshman. 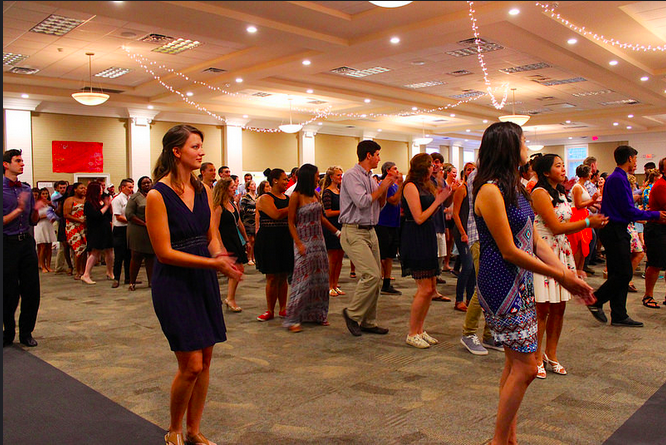 This year’s Orientation did not just meet all of my expectations; it surpassed them. I would encourage anyone who is considering being a part of Orientation to go for it! Orientation gives students a chance to make an impact on people’s lives and to be impacted by others, which I consider to be a really cool life experience. In case you live under a rock, or on the opposite side of the world, or in the tropics, let me be the first to tell you that the southeastern United States got snow dumped on us this past week. Actually, I think I read somewhere that 49 of the 50 states in the Union have snow on the ground. How often does that happen?? We had classes cancelled Wednesday, Thursday, AND Friday this week. Yes, that means I am currently just past halfway through an unexpected 5-day weekend. Some of us have been grateful for the extra time to work on papers or study for postponed tests. Some of us have spent our days [and nights] having snowball fights and building igloos (no, really. there’s a picture further on). Some of us have discovered how difficult it is to walk gracefully–and walk without slipping–on icy snow. Some of us experienced our first EVER snow day (poor Floridians!). Some of us discovered the magic of snow cream. And ALL of us have enjoyed the extra sleep and fun time with our friends! Below are some photos I took this week. obligatory snow selfie, because I adore snow. Last week, Morgan and I came up with this idea to let students tweet in convo. As a student here, you have to go listen to a speaker. You’re supposed to come out learning something and being academically and mentally challenged. But the truth is, a handful of students could care less. A lot of students have smart phones. Students with smart phones are attached to their smart phones. Separation anxiety is definitely a problem. Because of this, students’ attention spans are limited…think squirrel if you will. We expand the attention by doing what? Letting them actually use their phones in convo!! When we had the THRIVE convo with Dr. Norman, we decided to let the students have at it and boy did they respond. I think it’s pretty neat that a fellow student and I were able to communicate our idea and get faculty behind us to support that idea. Dr. Parker and the fellow THRIVE members helped spread the word. Student services printed off flyers for us. Communications set us up a Twitter account and ran a story on us in their paper. It was all pretty cool and I’m glad I got to voice my idea and see it come to fruition. It’s a great feeling knowing that you did something to spark the conversation and get students excited about convocation again. It’s a small step in the right direction. I’m in the process of planning the end of the year banquet for the Choraleers and it’s all kinda bittersweet. I realize I only have one more year with this precious group of people. Sure, from time to time we get on each other’s nerves, but at the end of the day, we are a family that sticks together and encourage each other. We share laughs. We share heartaches. We share triumphs. We share failures. But at the end of the day the greatest thing we get to do as a group is minister to people and in turn get ministered to by the very people we’re singing for. I’m actually going to miss people next year. Let’s be real, sometimes people just get on your nerves. But for what it’s worth, I’ve shared a lot of nice moments with the seniors that are going to be leaving next year. Time goes by so fast and at a time like this I feel compelled to make better use of all the time I’ve been given with the people that God’s placed in my life. You can learn something from people if you just take the time to get to know them. You don’t always have to like the person, but we are called to love each other. The banquet will be this Friday afternoon and I’m looking forward to it. We’ve got some great gifts prepared for our director and accompanist and the fellow officers. We’ve got a slideshow ready for people and are prepared for lots of laughter and reflection on past memories. It’s going to be a great time of fellowship. Being the editor-in-chief of The Mirror, our campus newspaper, definitely has its perks! Last month, Erskine’s Entertainment Board announced that Corey Smith would be performing at Erskine for Spring Fling. I decided to hold a contest to get more readers out to The Mirror site and the winner and I got to interview Corey Smith before he went on stage. 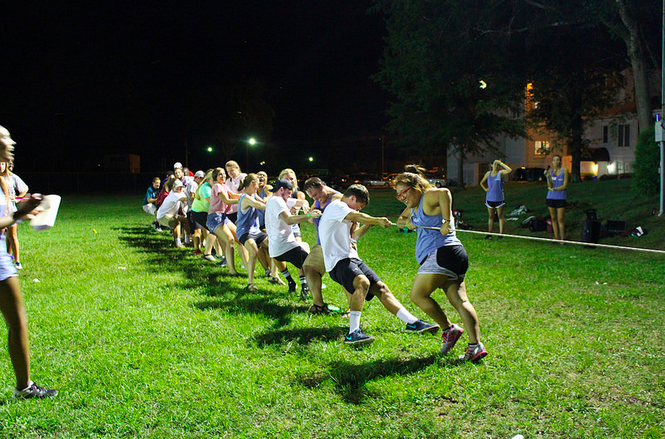 This just goes to show you how involved students are in the activities on Erskine’s campus. EEB is run by students who try to bring in bands they know Erskine students are going to love. The Mirror steps in to get student’s questions answered by their favorite artists. Student photographers capture the moments along the way. It truly is a cool process when you just think about it. Yeh, we have faculty advisers but we really do get to make most of the important decisions for our organizations. It’s pretty neat and the product is one that is enjoyable for many students and faculty and staff on campus. If any of you readers are Corey Smith fans, take time to read the following transcript from the interview. S: Who would you consider your biggest musical influence? My dad. It’s all encompassing. It’s impossible to say one. My dad sort of filtered what music I heard when I was a small kid. S: Tell us about your educational background. I went to Gainville College, transferred to West Georgia College and then I transferred to UGA. I was a social studies secondary education major. S: How many years did you teach? 4 years. Mostly world history, some geography, philosophy, guitar. J: What kind of musical background did you have? Did you take lessons or anything? I sang for as long as I can remember. I sang in church choirs. My dad was in bands so they were always having band practice around the house. There were always guitars sitting around. He would show me a few little things here and there but I never took interest in guitar until I was about 15. Then I just picked up a bunch of books and sort of applied. You know its little things like how to hold the guitar, fretting the chord that can take you a while to learn but because I’d been around it a lot of that just sort of came to me pretty quick and I picked up a lot of these books like Bob Seger, George Strait, or Garth Brooks. And I could already sing so I would start out singing and playing the chord. I had a youth pastor at a church that I went to when I was in high school that played guitar and he showed me some stuff and when I went to college I took formal lessons for a year. J: How do you actually write your music? Does your music dictate your lyrics or vice versa? It varies. It happens both ways. Sometimes the lyrics and the melody hit at the same time. More often it’s the music first and the music sort of dictates the vibe. But there’s more than one way to skin a cat. I think it’s important to experiment with a lot of different approaches. S: Who are some of your favorite mainstream artists right now? I like Kings of Leon, John Mayer, Adele, that’s good. Those are just a few. You might notice the glaring absence of country artists. J: Do you record most of the guitar parts on your CD’s or do you let someone else do it? I play guitar on every CD, on every track. It varies from record to record. Certain records I play all the guitar, electric and acoustic on. I don’t have a session player that I just go to. Now I have a great guitar player on tour with me. S: Tell us about touring with Florida-Georgia Line. I’ve been doing shows with them for about 6 months. I met them through my agent and had them on a few shows. It was a good fit. Fans seemed to like them. They’re younger so it’s nice to have the youth and the energy out here. S: Any advice for them? Take it slow. Enjoy it but don’t be in a hurry. S: For those who saw your tweets before you got here, tell us about going to your boys’ recital and their musical background. They’ve only been taking piano lessons for maybe 6 months. I want them to come to enjoy it on their own. I’m trying to be careful about forcing it on them, pushing it on them but they have drum sets and guitars and stuff already. They don’t listen to me when it comes to instruction though. S: You’ve come such a long way in your career. What has motivated that? What’s the driving force? God. Some people would call it God. It’s my calling you know. It’s kinda like I’m believing that I’m doing things for a reason and then certain opportunities come up and I weigh the options. I had a friend of mine explain life like a fork. At some points its like things just make sense and you have these tuning fork moments where you’re like aw, this is what I’m supposed to do. You don’t have those a lot but as you get older and you look back it all starts making sense and you realize that’s kinda your path. I feel like music has been that way. There was a time that where it was purely just what I did for enjoyment. I would play for friends at a party. I started playing in bars for crowds of 50 people. I played for my students at school. It felt right. My goal was just to be able to make a living doing it so I expected to be touring about three hours from home and playing for a few hundred people every night and the next thing I knew I was playing for thousands of people and now I’m touring all over the country. J: Do you have any classical musical influences? When I was in college I took pick style classical so that was the training there. It’s only recently that I started listening to classical music. I think classical music influences everybody whether they realize it or not cause it’s such a part of popular culture underneath the surface. Now, I listen to a lot of Gershwin and Eric Copeland. But that’s just kinda stuff to relax to. The Gershwin stuff though is really helpful as a writer cause he’s really hooky and has great melodies. S: How do you deal with people who have negative things to say about your music? I try to ignore it but sometimes it’s hard to. I just quit going to the places where I know I’m going to find that stuff. I think there a lot of negative people out there who just use [the internet] as an outlet. I don’t mind criticism especially when it’s fair. I think all different types of people are guilty of it. I have a hard time fitting in anywhere. I don’t fit in well in country because I’m too progressive or too untraditional. I don’t fit in well with rock because when they hear me all they here is country. So I just get in my own little group.